I was Surfing the web and avoiding more important things when I stumbled upon this interesting article which is an interview with Malidoma. I’m good looking forward to co-facilitating some workshops with him in 2011 so I thought I would pass this along. I hope you enjoy. In the Dagara tribe of West Africa, the name Malidoma means “He who makes friends with the stranger/enemy.” One wonders if the parents of Malidoma Patrice Some sensed that the name they gave their son would portend so much of his life. Rising out of his spiritually rich, yet materially impoverished village in Dano, Burkina Faso, West Africa, Malidoma has become a world wide friend, teacher, public speaker, and author of three books: Of Water and The Spirit (his autobiography), The Healing Wisdom of Africa, and Ritual: Power Healing and Community. With the permission of the Dagara tribal elders, Malidoma is now sharing the indigenous wisdom of Africa with the West. This amazing man from humble origin has earned three masters degrees and two doctoral degrees – the first from the Sorbonne (in Paris) and the second from Brandeis University. In a remarkable way, Malidoma bridges cultures like no one else I know. As Malidoma speaks, his voice carries the excitement, passion, and palpable spiritual quality that befit a gifted medicine man. Only the most accomplished Diviners, Gate Keepers, Shamans, and spiritual leaders are invited into a special “Elder” initiation in the Dagara tribe. Due to Malidoma’s accomplishments and importance to his community, he became, at the age of 42, the youngest ever to become an Elder; not to mention the first with a full Western education. 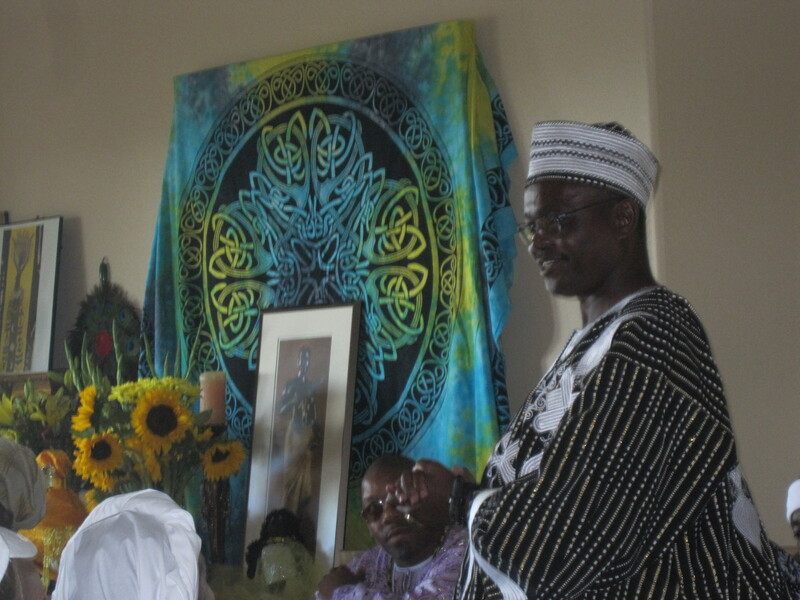 He possesses a unique understanding of how psychological disciplines and spiritual rituals can be utilized together in assisting individual personal growth. “Ritual is the most functional means by which archetypal energies are dealt dealt with,” Malidoma began. “Indigenous people have been aware of that for eons. In the modern era, we focus too much on psychological counseling, he noted. There is a tendency for people to ‘linger endlessly’ in therapy for without receiving significant help. The “shadow” parts of our lives “keep coming back.” Malidoma believes that dealing with “the things we cannot escape” is best accomplished within the sacred space of ritual. Malidoma said we tend to “project a godly power” onto human beings with a resulting dependency on others. It is in the nature of humans to project, he added. The question is, where do we direct the projections? Malidoma suggested that men should learn to trust their own ability to create sacred space, where they can be “vulnerable in a sacred fashion and allow themselves to be dismantled so that the rebuilding can produce a lasting result. The sacred space to initiate men is not necessarily a physical place, but an energetic place. Malidoma said he believes men use the need for “safety as a condition of healing” as an excuse not to deal with the problem. “We must endanger the problem by confronting it,” Malidoma instructed. “It is to be dug out of its hiding and exposed to the air. It cannot breathe oxygen. The light of day is lethal to it. That’s why the dragon tells us that we should be safe, because the dragon wants to be safe. We end up actually serving the very thing we want to be rid of. Malidoma said the dragon wants us to be introverted. Malidoma experienced pain early in life when he was abducted from his tribe by Catholic priests and forced into a foreign Western culture. After a number of years, he escaped and returned home, where he was initiated into his indigenous community. The author said he has found “hope and dignity” through the daily practice of his tribe’s ancient rituals. He prays at the shrine of his ancestors, offering them water or libation, and asking the spirit of nature to walk with him throughout the day. In Malidoma’s village, the men are the spiritual leaders. The community is strengthened by “invoking the sacred,” he added, but not by making themselves exclusive. People sitting around and talking about the faults of other people are not a true community. Yes, I see how we do this individually as well and we build walls around ourselves which prevents us from engaging in community.